(Bloomberg) -- U.S. leveraged loans just had their best quarter since 2010, despite lackluster performance in March. The floating-rate asset class has returned about 4 percent year-to-date, trailing both investment grade and high-yield bonds. Most of the first quarter’s robust leveraged loan return came from a January rally that followed a steep sell-off in December. As the Federal Reserve signaled a more dovish monetary policy, investors turned away from floating-rate leveraged loans, which they had been buying as a hedge against rising rates. 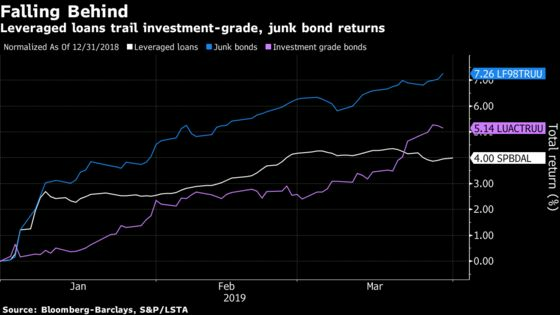 The S&P/Leveraged Loan Total Return Index fell 0.17 percent last month, while the Bloomberg Barclays U.S. investment grade bond index gained 2.5 percent and U.S. high-yield rose 0.9 percent. Junk is having the best start to a year since 2003 while BBB rated bonds are doing the best since 1995. Dedicated loan funds saw outflows accelerate, while collateralized loan obligations have had a slow start to 2019. Providing support is a shortage of supply as new money launches plunged in March.